This is an account of my first direct encounter with a major hurricane. I will begin this post with a video. The video embedded just below is long (almost one and one-half hours). It covers the passage of Hurricane Michael over the southeastern portion of Marianna, Florida during the afternoon of Wednesday October 10, 2018. This is unedited video and covers passage of the northern eye wall, the eye, and southern eye wall. The video cannot possibly do justice to the intensity nor the relentlessness of the storm for four hours. Due to the length, you may wasn't to skip forward, but there is some value in watching the entire video. Feel free to share this blog post on social media, via link, but please do not use the video via media without contacting me first by email at mikewx2@yahoo.com. I left my friend's house in Alabaster, Alabama at 10:08 a.m. on Tuesday 10/9/2018. I had been watching the tropical system named "Michael" develop for a few days and by this time it was pretty evident that it would make landfall in the vicinity of Panama City, Florida as a major hurricane in a little over 24 hours. As I travelled south on Interstate 65 through Alabama, northbound traffic was bumper-to-bumper in Central Alabama between Birmingham and Montgomery. In the southbound lane, I saw numerous utility and emergency response vehicles on their way to assist during the aftermath of the storm. My initial plan was to drive to Dothan, Alabama or Marianna, Florida. I wanted to witness hurricane conditions, but in a safe location. I made it to Dothan by 2:30 and decided to continue driving south. By 3:00 I was at the Alabama-Florida state line and continued driving south. I continued all the way to the northern part of Panama City, Florida, where I arrived at 4:30. There was very little traffic moving in either direction on US Highway 231 in Florida. Most, but not all businesses were closed on the way there. Upon my arrival at Panama City, I added a few gallons of gasoline and topped off my gas tank. I pulled in to the LaQuinta Inn and decided to hang out in the lobby for a little while. The hotel receptionist said there were no vacancies but they were allowing people to stay in the lobby. There was a group of boaters who had stopped in Panama City on their "Great Loop" trek. One of the couples was leading the people in song. Many of the songs were hurricane related. I enjoyed meeting an older gentleman, also named Mike, who owned a successful businesses, who was helping captain one of the boats. He told me many stories of his travels. Between the music and Mike's stories, I was enjoying myself, but the hurricane remained on my mind. I interrupted my conversation with Mike at 6:40 briefly to take a picture of the colorful sunset. It was spooky thinking about the contrast between the beauty of the sunset and the ugliness that would soon result from Hurricane Michael. As the evening progressed, I decided to stay in the hotel lobby. I spent much of the night using the complimentary computer to monitor weather and social media for updates on Michael. I think I slept about an hour and one-half in my car. 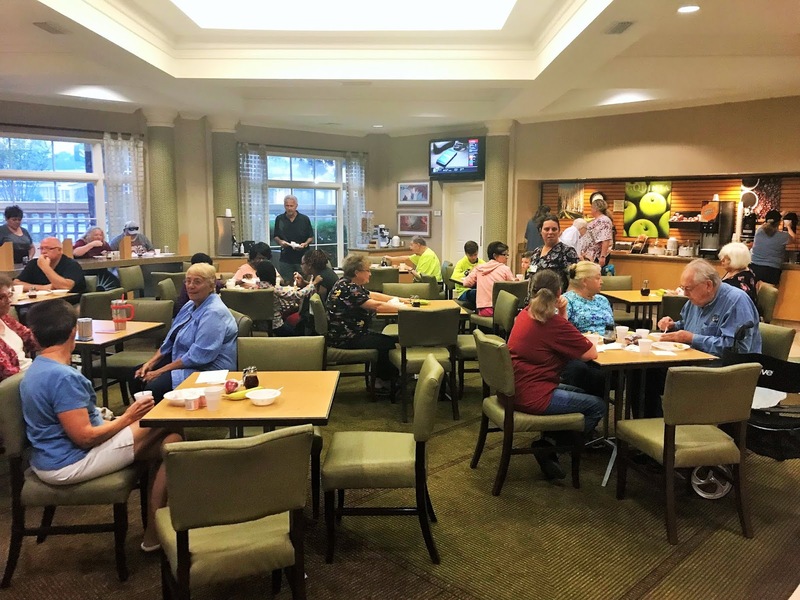 It was clear that Hurricane Michael was going to be devastating to the northwest Florida coast as well as areas to the north. I was debating whether or not to stay at this hotel or to head back north toward Marianna, which was my original plan. Overnight, Hurricane Michael continued to strengthen and there was no reason to believe strengthening would not continue right up until landfall, as it travelled over some very warm water with no significant influence from shear, nor intrusions of drier air. I also had some concerns about the projected path. The National Hurricane Center had consistently placed the center of Michael making landfall east of Panama City, near Mexico Beach, Florida. However, in order for that to happen, Michael was going to need to slightly change course and begin a move just east of due north. It seemed like that turn was slower to occur than I had hoped. The primary reason the exact path of Michael was so critical to Panama City was storm surge. If Panama City took a direct hit or if Michael made landfall to the east, as projected, the storm surge would not be as high. On the other hand, if landfall was to the west, devastating storm surge would be inundating Panama City. 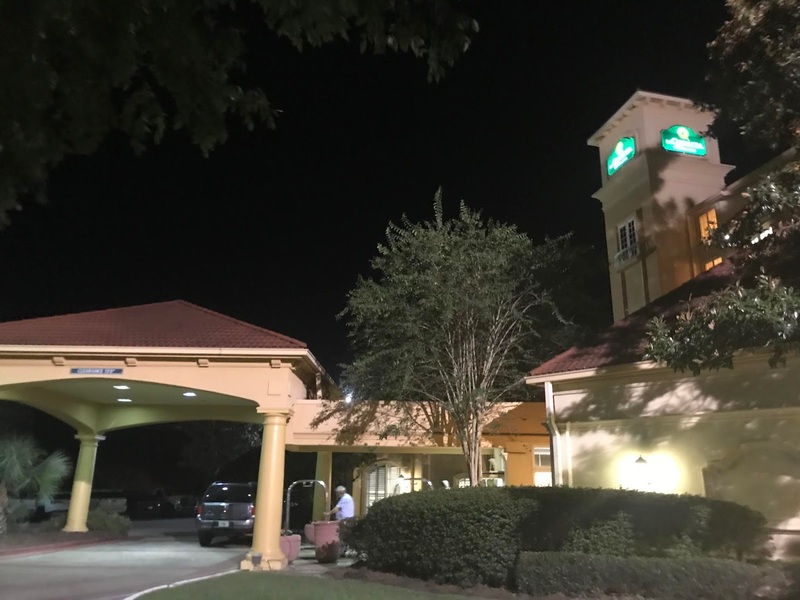 As the night wore on, I decided that regardless of the exact path, Panama City was probably not where I wanted to stay, even though the hotel was about seven miles from the coast. 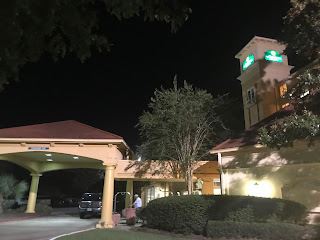 I thought the hotel was tall enough and strong enough to protect us from storm surge or winds, but I was concerned about losing my car due to surge and/or flying debris, and I was also concerned about being stranded without food, electricity, communication, or transportation for a very long time. Because of those concerns, I decided to leave in the morning. 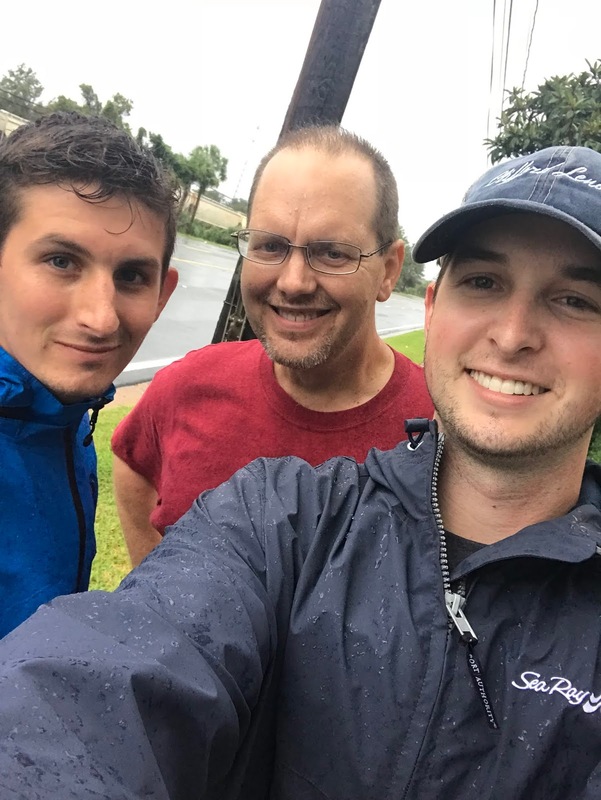 Early Wednesday morning before 6 a.m., I met Joey Krastel (@NimbusStorms on Twitter) and Jake Smith (jwsmith_056 on Twitter) who were young meteorologists from Iowa State University. They spotted me at the computer in the lobby and asked whether I was a meteorologist. We talked at length over the next two hours over breakfast regarding the storm and plans and strategies. They decided to stay at the hotel. I was leaving, but still deciding exactly when to leave. I wanted to stay in Panama City as long as I could while still being able to drive safely to Marianna without encountering severe winds or flooding. When I finally pulled out of the hotel parking lot at 8:40 a.m., the eye wall of Hurricane Michael was a little under 60 miles from Panama City with maximum sustained winds of 145 miles per hour. It was moving north-northeast at about 13 miles per hour. We had been experiencing tropical storm force wind gusts since about sunrise (6:40 a.m.) in Panama City. I knew that I had reached the time that I needed to make a final call to stay or go, because the worst case scenario for me would have been to be caught on the highway during hurricane conditions. As I drove north, I listened to local radio reports and occasionally pulled of the road to check on the progress of the hurricane. Two facts became apparent. First, it had begun the jog toward the northeast and it seemed to be aiming directly for a landfall near Tyndall Air Force Base and Mexico Beach east of Panama City. Michael was rapidly strengthening and that momentum seemed like it would continue all the way to landfall. At about 10:05, I arrived at Cottondale, Florida, near Interstate 10, just a few miles west of Marianna. There I parked at the Loves Truck Stop and McDonald's. I considered staying there as I continued to monitor the storm. My cell phone signal was weak, so I was able to benefit from using the WiFi from McDonald's. Incidentally, like almost all businesses, the McDonald's was closed but the truck stop was rather busy. I decided to drive a few exits to the east on Interstate 10. I believed I could find a safe place to watch the storm there, and that the eye would likely move right over that area. By 11 a.m. I was in the southeast part of Marianna at the America's Best Value Inn. This was an old hotel, but it seemed like a perfect spot to ride out the storm. The receptionist kindly gave me access to their WiFi password and I walked around the hotel. I found a strategic place to park my car where it was less likely to be hit by wind-driven debris. The hotel was one that had rooms opening to outdoor hallways and breezeways. I found a room on the southern side of the second floor that was ideal to watch the storm approach from. It was a small concrete room with an electrical outlet, ice machine, and no door. I decided I could watch the approach of the northern eye wall safely from that location. I was keeping an eye on radar as the storm was making landfall between Mexico Beach and Tyndall Air Force Base. Hurricane Michael made landfall with maximum sustained winds of 155 miles per hour and a minimum central pressure of 919 mb as a high end Category 4 storm. The 919 mb pressure at landfall made Michael the third strongest hurricane ever recorded making landfall in the United States. The pressure of 919 mb is consistent with a Category 5 storm and the 155 mph sustained winds was only one mile per hour short of making Michael a Category 5 storm. By approximately 1 p.m., hurricane force wind gusts had begun in southeastern Marianna. I took video and some still photos as Hurricane Michael passed directly overhead between 1 p.m. and 5:30 p.m. The eye passed directly over my location at the America's Best Value Inn, 2086 Florida Highway 71, between 3:00 and 3:30 p.m. Based on my observation from the surface and looking at radar images that were later sent by friends, it appeared the center of the eye of Michael passed over around 3:15 p.m.
Because my phone battery was weak, power was out, and my phone signal was weak, I turned off cellular service and took as much video as I could of the storm. The most impressive things I noticed were the length of time the winds were sustained at hurricane strength and the manner in which they relentlessly ramped up. The best way I could describe it is that winds ramped up to a certain "plateau" speed. Then a higher gust would move in (you could usually hear and see the higher gusts and heavier rain sheets coming before they arrived). The winds would again plateau at this higher level until the next gust approached and an even higher plateau was reached. This process repeated itself from about 1:40 p.m. until the eye arrived at approximately 3 p.m. The approach of the eye was clear to see. I was without radar data so I was relying on extrapolating what I saw previously on radar and what I was observing. In the minutes before the eye approached, precipitation intensity decreased, although the winds remained high. I observed a lighter sky appearing on the horizon behind the darker clouds. As the rain and wind decreased rapidly, it became obvious that we were in the eye. People started walking around. Birds started flying. Since my battery was down to about 15 percent on my phone, I quickly walked to my car and tried to charge the phone. I received a few texts with radar images sent by friends. Those images confirmed what I observed regarding the eye. By the time the eye reached Marianna, it had filled in with cloud cover, but the rain and wind stopped, temporarily. While in my car, I thought about what would happen after the eye passed. Winds would resume rapidly and come from the opposite direction, the west. The northern eye wall had produced considerable damage. Numerous trees were snapped off and uprooted. Parts of the hotel were removed and scattered about, along with other debris. There was a metal portable carport that had been blown into a position just west of my car. I decided to move my car, which proved later to be a good move! The winds from the southern eye wall came out of the west and blew that metal carport exactly where my car had been parked. At about 3:30, the southern eye wall arrived. As expected, high winds arrived quite suddenly. Despite the fact I was aware this would happen, during the short time it took me to get from my car back to the hotel, I was hit by a small piece of debris on my leg. The southern eye wall was intense, but not as intense as the northern eye wall. Despite the lower intensity it was probably more dangerous. All of the debris that had been broken loose from the northern eye wall was now being blown back to the east by the southern eye wall. All of the people at the hotel who were initially excited by the extreme winds evidently grew tired of watching it. During the northern eye wall there were dozens out of their rooms watching the storm from their doorways, the walkway or the breezeway. By the arrival of the second eye wall, I believe I was the only one still watching. By about 5:00, winds were still very strong, but I found a brief time window when I could make a dash for my car. I was soaking wet. My phone had lost power, so I took a few minutes to start the phone charging, eat a snack, and prepare to (hopefully) leave. My goal was to get all the way back to Alabaster, Alabama, but I didn't know exactly what obstacles I would face. I left the hotel parking lot at 5:46 p.m. At this point I was very glad I topped of my gas tank the night before in Panama City. Hurricane Michael lost very little strength in the 52 miles from landfall at Mexico Beach to my location at Marianna. I was certain that it would remain strong as it sped to the north-northeast. As a result, I expected massive power outages and downed trees on my way back. Fortunately, I was very close to Interstate 10. Still, it took me almost two hours to travel the 12 miles along I-10 to get to the US 231 exit. This was because the interstate was littered with trees. They were being removed from the westbound left lane. Once I finally made it to US Highway 231 at Cottondale, Florida, the coast was definitely not clear. There were trees in the road (especially the right lane, seen sporadically well into southeast Alabama. Because power was out and visibility was extremely limited, I had to drive very slowly to make sure I did not run into a tree. Once I arrived in towns such as Dothan and Ozark, Alabama, almost all power and street lights were out. One problem was that it was not easy to see intersections until you were right upon them. I feel very fortunate to have made it out of the area damaged by the storm without having an accident, mechanical issue, a flat tire from a nail or sharp piece of debris, or any other issues. This was certainly an answer to prayer. Fortunately, I had enough gasoline. This was significant because all gas stations were closed until I got to Troy, Alabama. After a brief stop in Troy, I made the rest of the trip to Alabaster and arrived at 12:38 a.m., about seven hours after I left Marianna. Normally that trip would take about four hours, but I am not complaining. This was a trip I am glad that I made. I have never intentionally tried to "chase" or witness a hurricane before, although I've thought about it for a long time. I have always been concerned about safety, but also concerned about being trapped, losing transportation, etc. Fortunately, I was able in this rare situation, to witness Hurricane Michael as a Category two storm on the Saffir-Simpson scale (winds of 96-110) miles per hour during daylight hours, in a relatively safe place, away from the coast. While I was in the middle of the storm I was confident that I was witnessing wind gusts over 100 miles per hour. That was confirmed when I learned that a wind gust of 102 miles per hour was officially recorded at the Marianna airport, a few miles to my north. Unfortunately, I was not equipped with weather instruments. I would have really liked to document the changing wind speed and pressure. Thankfully, the death toll (as of this writing) is not as bad as one might normally expect from a borderline Category four or five hurricane. No loss of life is acceptable, but this could have been much worse. Property loss was extreme, especially at the coast, but damage was extensive well into the Florida Panhandle, Southeast Alabama, and southwest Georgia and beyond. This storm was surreal to behold and the power of God's creation amazed me. I have seen many, many storms, but this is the most intense storm I have ever actually been in. As I was witnessing the extreme winds I thought, "As strong as this is, it is only a very tiny, miniscule fraction of the amazing power of God."